Carrer Dels Capellans, 4, 08002 Barcelona, Spain. Hotel Barcelona Catedral is a new and modern designed hotel. It was opened in october 06 located just where you wanted right in the centre, next to the Cathedral, las Ramblas and the Plaça Catalunya. It offers 80 well-equipped rooms every sunday free guided cultural walks through the gothic quarter. Leisure: terrace swimmingpool with fitness center, personal trainer service, corner with free access, Barcelona tourism activities and information, theatre tickets, cooking and wine testing lessons, free and personalized cultural tours and meeting and banqueting rooms. 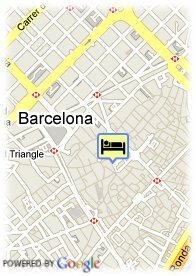 Paid covered parking at the hotel (33.00 €), Reservation obligated.